Letter concerning tests of Lamb's Lim-Rest crutch occurring at Walter Reed Hospital and at Percy Jones Hospital. 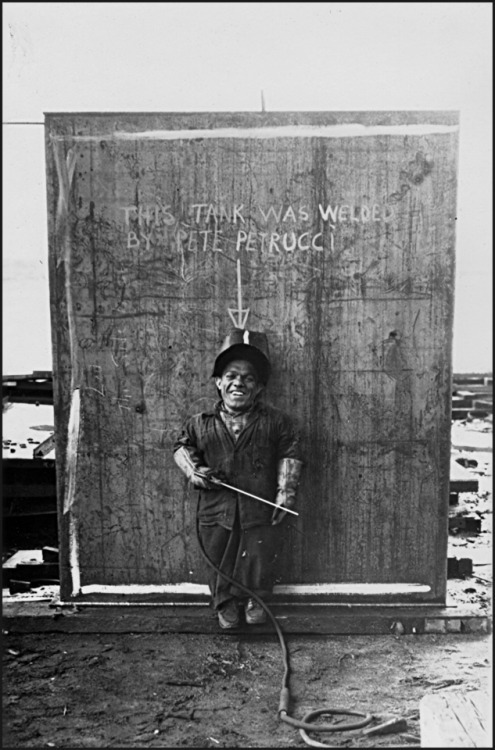 Today’s Worker Wednesday post features Pete Petrucci, a welder at the Pusey & Jones Corporation, seen here in April 1944 with a recently constructed tank. The Pusey and Jones Corporation was a Wilmington, Delaware company founded in 1848 to manufacture and repair general machinery and steam engines. In 1853, it also began shipbuilding, which would become its primary activity. During World War II, Pusey & Jones was engaged in building cargo ships for the U.S. Maritime Commission and hopper dredges for the U.S. Engineer Department. Pusey and Jones built almost five hundred ships in its company lifespan. The company shifted all of its operation to papermaking after World War II. Pusey and Jones closed in 1959. This photograph is part of the Hagley Library’s Pusey and Jones Corporation photograph collection (Acc.1972.350). To view more photographs from this collection online, click here to visit its page in our Digital Archive.